This version of Iori is similar to his pre-KOFXII days (most popular in KOF98 and KOF2002), which he had his qcb+P rekkas, qcf+P flame projectile, and other special moves he was known for. His movelist hasn't changed at all inputs wise but he has some differences from the past games he was featured in which makes him a unique and strong character in KOFXIII. He is a bit different from his Claw version but they are both loosely classified as rush down type characters. This version of Iori is cut and dry. EX Iori is a good edition to the KOFXIII, as the famous purple flames were absect from the prequel. Much like Kyo has a EX Kyo counterpart to highlight his current game play with his Rekka Specials, SNK blesses people with a version of Iori that allows him access to his purple flames and his previous moveset. In KOFXIII, EX Iori is a brilliantly constructed character as he always has been. EX Iori is a jack of all trades, along with a particularly good set of tools to use at his disposal. EX Iori's projectile will normally have a rather nasty start up leaving him unsafe. Iori needs to time his projectile use according to the opponents movement. The EX Yami Barai is not as useful as it seems because the damage of his combo will scale badly and you can't really combo into it unless you drive/HD cancel into it. EX Yami Barai can be implemented as a punish for those who use their fireballs recklessly. The projectile itself appears to be quick, but Iori still suffers from slow start up so it is best to use this moderation. Iori gets his signature DP anti-air back and is a three hit combo, much like the regular Kyo's is. Iori also has his Rekka Specials back, which can used to construct juggle opportunities, but it should be noted that Iori's Rekka combos are a little more problematic and should be used with combos instead. An good BnB's would be something like this: cr.B, cr.A, f.A, QCB+A,QCB+A, and QCB+A for a hard knockdown(the last three commands was his Rekka Special, used as a combo finisher). Another noteworthy quality to EX Iori is that he has a lot of OTG opportunies from his EX Koto Tsuki (HCB+K). The EX Koto Tsuki acts as his secondary command grab for 1 to 4 frames worth of start up and can be used after a hard knockdown on an opponent. EX Iori has a very good command grab that can be easily used in combos and restanding the opponent after placing the opponent in the air, especially during an HD combo. Iori is a very powerful character but requires very good execution to truely be affective. qcb+P rekkas have slow start-up and bad recovery. Not safe on block, except for the first qcb+A rekka. hcb+K is VERY slow and unsafe. Doesn't cause massive guard damage like in KOF02, and is harder to combo into. His qcf~hcb+P (Maiden Masher) doesn't duck under projectiles anymore. His NeoMax (qcb~hcf+AC) isn't as fast or subtle has his HSDM in KOF02. far A: 30 damage, hits mid. A short, quick ranged punched to the midsection. By accident this punch may turn into his s. A if you are too close. It is best to use this move when you are shuffling back and forth within close range of your opponent while he is in the corner for can catch mashers for you can hit them with a normal with more range (ie. far B, far C, or D) or for you can wait for whatever escape option they may try, the continue pressure. s. A: 25 damage, chain/cancel-able, hits mid. This is a useful fast close punch that he has kept in previous years and remains useful in this game. It places him almost neutral on block, which is good for offensive pressure, especially in the corner. It is best to use this move after a hop (empty or attack), or from a low mid attack (d.B or d.A). You can also chain this move into his s.B (a standing low kick) or his d.B (a crouching mid punch) to extend your close-range pressure. far B: 30 damage, hits mid. A very quick forward kick to the midsection. The best time to use this kick is when you are a bit outside of his sweep range if you are mid-screen to regulate space and to stop opponents trying to advance toward you slowly (or even if they are running up toward you). In the corner this kick is useful when you are being pushed back from the opponent blocking your more closer range normals. A really useful poke which is almost neutral on block, and can be used for some frame trap setups involving his rekkas. s. B: 30 damage, chain/cancel-able, hits low. One of Iori's best and most useful normals in previous years. This very fast toe aimed quick hits low, and it's a very important standing low normal which is integral for his mix-up game. The kick can be activated pretty far when in close range (after his s. A) and it is best to throw this out when you are hopping in on an opponent in the corner, or midscreen, or whenever after his s. A. You can also chain this move into his s. C if you are close enough. far C: 70 damage, whiff/cancel-able, hits mid. Pretty much the same scratching swipe as past years. It is best to use this to punish the opponent when they whiff something with heavy recovery frames. You can get punished yourself if you're trying to poke this out if your opponent has something with moderate start-up frames and if it can reach him before the recovery is over. It's good to remember that you can whiff cancel this move too. s. C: 70 damage, cancel-able, hits mid. Much quicker start up than his far C, and it is neutral on block too. Up close you will probably be using this great deal to cancel into your specials, but be careful because someone may guard cancel roll it because it is a bit difficult to confirm into. Defensively you can use this move against those trying to jump over your head mid-screen, and against opponents jumping high on you in the corner while standing. far D: 80 damage, hits mid. The range compared to his past years looks a little shorter, and it is just a bit. It still is a good poke for stopping hops preemptively and for controlling space. Similar to his far C, you have to be careful poking this out because it can be stopped by a fast starting EX move or anything else that can catch it in its recovery. Overall, a good poke to use at mid-range distance. s. D 70 damage, hits mid. This close high heel kick is best used as an anti-air against cornered opponents trying to escape by jumping. Proper spacing is important for this move because if you are too far, a far D will activate instead. This move can whiff if you are close enough but too far which can be problematic because Iori can be punished upon recovery by the opponent's light (and some heavy) normal attacks, and it isn't whiff cancel-able either, so it's best to use his s.C at close ranges when possible. cr. A: 25 damage, chain/cancel-able, hits mid. Almost has the same range of his far A, and it can be chain into his s. A, d. B, and s. B. It's great for pressure and is useful for a quick confirm into his rekkas or his f+A. On defensive you can use this move against those trying to rush towards you, and against some moves that have lower body invulnerability. cr. B: 30 damage, chain/cancel-able, hits low. One of his best crouching normals, and has kept much of its importance from previous years. Great range, safe on block, easy to combo into and lowers Iori's hurtbox a great deal. cr. C: 70 damage, whiff/cancel-able, hits mid. An diagonal upward hook that is good for stopping high jump-ins. It may be beaten out by some characters sharped downward angled jump attacks, so be careful using this as an anti air. cr. D: 80 damage, hits low. Kind of a drop kick sweep that has kept with him for many years...and for many years this has been his worst ground normal. The recovery on whiff and block is bad but at least he gets pushed back away from the opponent if it is blocked...if it's whiffed far, it can be punished with a fast starting special move or DM. Up close if it's whiffed, Iori can be thrown, but if it's blocked far away, he will recover in time to throw out his dp+A. The only shining feature this normal has is decent start-up with it's long range, so experiment with it for punishing certain characters special moves. j. A: 40(45) damage, hits overhead. This jumping punch has a hitbox pointed at 5 o'clock, which is good for jumpins, and hops. Comparing this to his j.CD (which has around the same downward angle) it has longer hit stun, and knocks the opponent down if it hits. The short start-up frames can be useful to use this punch as a quick, close to mid-range air-to-air to stuff the opponents jump attack if you use it early enough. j. B: 40(45) damage, hits overhead. A long ranged pointed flying kick that has a hitbox in the 3 o'clock range. One of his most useful normals that he has, this jumping kick has a far horizontal range, and is best use defensively. It can stop a lot of jumpins and hops far a moderately far distance, but be careful using it at close range to stop hops, because you might get hit before you jump, so it is best to this preemptively and it is okay to zone with from time to time. Keep in mind this kick misses on crouchers, so try not to use it has a direct jump in. j. C: 70(72) damage, hits overhead. Kind of a downward swinging forearm punch that which hitbox is located a little before 6 o'clock. This is best used for corner pressure because it hits fairly deep on crouching opponents, and his good amount of block stun to employ his high/low mixup game. It is also good for jumpins mid-screen as well, but it does hit a little on the late side, so you may be anti-aired before his punch activates. j. D: 68(70) damage, hits overhead. 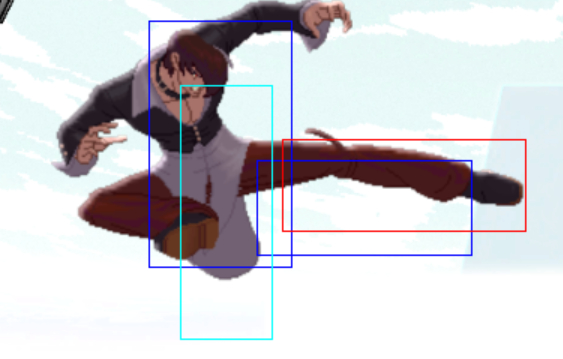 This is kind of a funny looking flying jump kick that has somewhat of a swinging hitbox where direction goes from in between 2 and 3 o'clock down to 4. It is best used for air-to-air similar to his his j. B, but this kick has more startup, and less range. This move has the ability to hit crouching opponents, but it can miss totally if its performs at start of your hop. CD: 75 damage, whiff/cancel-able, hits mid. A slow shoulder thrust that could be used to stop some far distanced hops pre-emptively. It's good that you can whiff cancel it though, if you want to trick opponents into thinking you're just going to whiff a normal that has slow start-up and bad recovery. j. CD: 80(90) damage, hits mid. Similar to the location of his j. A hitbox (between 4 and 5 o'clock) but much better and more useful...way more block stun, knocks down on hit, and it has great priority. Use this over j. A unless you want a differential in block stun. GCCD: 10 damage, hits mid. Same animation as his stand CD. Sakahagi = b/f + C/D close: 100 damage, does not cause a hard knockdown. If the opponent rolls this throw, they receive a great deal of space, so if they are in the corner, stick to a C throw. Yumebiki = f+A, A: 40+57 damage, cancel-able, hits mid. The first part of this combination, which is f+A is a common command move cancellable from his light normals, which then can be cancelled into a few of his special moves. You will this move pretty often in his combo list. By itself, it is mainly animation-wise his far C, but he isn't safe if this move is blocked. The second part of this move is sort of a slow back hand which is cancel-able too, but it is hard to connect this punch because of the push back from the first hit (f+A), especially if you use normals before it that already push him back. Also, his recovery isn't so great once it is whiff either, it is best to just stick to only f+A. BUT, you could use the 2nd punch to maybe surprise your opponent at mid-range, thinking you are just going to whiff f+A by itself, then just whip it out and hit them if they are trying to hop in or run at you. Something that you may have to experiment with defensively. Yuri Ori = j. back+B: 55 damage, cancel-able, hits mid. If Iori didn't have this crossup kick, then he would not be as good as he is. It is an essential move for his mixup game, especially on wake up. It is best to use this move if your opponent is close to you and continues crouching (after you do a d. B then hyper hop over them), after they are knocked down hard from a hcb+K, or knocked down after his qcb+P rekkas. Experiment and find different ways to hit them on their wake up, or during close blockstrings midscreen. On a cornered opponent, you can also fool your opponent by whiffing this move to make it look like a j. C., and the whiff recovery isn't bad either, so you try that sometimes, while you are on the offense. Gofu In "Shinigami" = f+B: 70 damage, cancel-able, hits overhead. The difference from previous years regarding this overhead is firstly it doesn't hit twice anymore only once. Also, if performed by itself you can cancel his supers from it, and you can also HD activate it, which makes it more useful in this game. On block he isn't terribly disadvantaged, but if you use it in a blockstring (after s.C), your opponent can just roll under it. Yamibarai = (qcf+P) - Iori throws out a purple sparkling flame that skims the floor. The A version travels at a slower speed than the much faster C version. Compared to previous KOF games, he is stuck in recovery for a fair amount of time, so it's a little difficult to try to anti-air people with dp+P if they are jumping at you from a certain distance. It's good to end with this move if you're opponent is in the corner in blockstun but be careful of the defensive option to guard roll your command normal before the fireball comes out. Don't be predictable with this move because some players can just simply hop over it and punish you. (EX) = qcf+A+C - This fireball travels the ground at almost the same speed as his qcf+A. 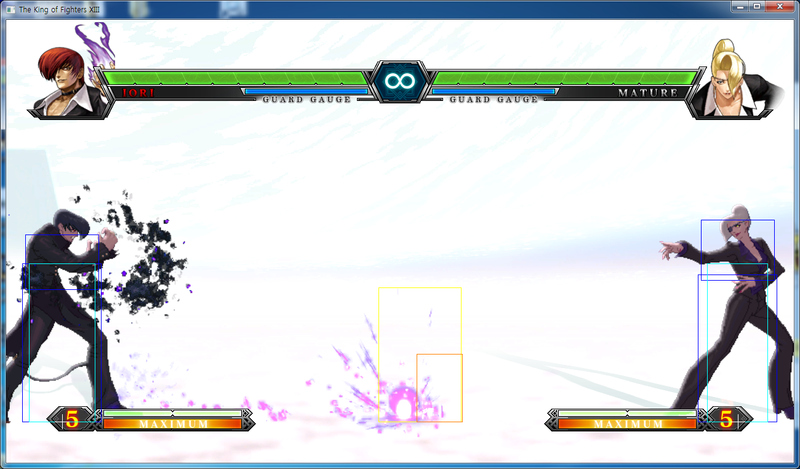 Upon hit, it freezes them for 3 to 4 seconds (up to 7 hits) which makes them completely open to any combos you desire. If the opponent lands on the fireball from a jump, they will be in an airborne reset state. The start-up and speed of this fireball is rather slow compared to other EX projectiles in the game which can actually throw some players off sometimes, so, it's best to use this move as carefully as you can if you don't want it to miss. Oniyaki = (dp+P) - This dp has kept a bit of its same properties as the former KOF games he has been featured in. The A version has quick start up, hits only once, but doesn't have any invincibility at all. It is good mostly for stopping predictable jump-ins and hops at a far range. If you whiff this move (or it is blocked) at close range, you are open to punishment. The C version starts up slower but has a small amount of invincibility in the beginning, which can hit some low meaty attacks. It also hits the opponent 3 times, which the 2nd hit can be drive or super canceled. If you are going to use the C version as an anti-air, it should only be strictly against full screen super jumps because it might miss against short hop and some jump attacks because of its steep vertical ascension. (EX) = dp+A+C - This very fast triple uppercut has invincibility at the start which ends around the time he performs the second uppercut. It's good for an anti-air option even though you might not get much damage out of it because a couple of the hits may miss. You can drive or super cancel this move before he goes airborne with the third and last dp. Aoihana = (qcb+P) up to 3 times - Iori's rekkas has gone through a very small change compared to previous KOF installments. In KOFXIII, the first hit of the rekka seems to be much slower start-up wise, features much more frame disadvantage...and this is talking in regards to the A version. The C version starts up very, very slow, and even if you try to compensate some space by doing a few normals into a command move, Iori ends up very close to them. The second hit of the rekka, for the A version is horrible on block as well, and doesn't leave space between you and opponent. The C version of the second hit is very bad on block as well. The last hit of the rekka, which is an overhead, knocks down hard upon hit, while on block (for both punch versions) is terribly unsafe. You can interrupt the last hit of the rekka for the A version with a fast start-up invincible dp, EX move, super, etc., while you can simply roll out of the C version while his animation is airborne. It is easy to differentiate between someone performing the A and C versions on block by just the speed. The A version has a much faster animation, the C version looks very slow. It is best to confirm into these rekkas on hit, performing any of them on block is very risky and is not recommended. Even if you perform one of them in a block string, your opponent can possibly guard roll one of your normals and escape out of the corner. The bright side to this move is that when you complete the rekkas, you get a free hard knockdown for some good okizeme and safe-jump option if timed correctly. You can also combo both of the punch versions from a few light attacks for a very quick and easy punish option. (EX) = qcb+A+C up to 3 times - The EX rekkas travel farther than the normal ones, but do not have any kind of invincibility at all. The start-up almost resembles the A version of the normal rekkas while the frame disadvantage on block is a bit lower, it can still be punished by specials and supers with fast start-up. The last hit of the rekka comes out pretty fast, so its difficult to interrupt while you are in block stun...its better to wait until the final hit to punish it. When all 3 rekkas hit, the opponent is knocked down hard, almost at the same positioning as a finished C version rekka. One special feature about this EX version, is that the second hit can launch the opponent up pretty high (especially after a drive canceling a second rekka), so in the corner you follow up with a super or reset them with a jump if timed correctly.You can also empty cancel this version of the move as well: qcb+AC, qcb+AC, qcf,qcb+A, ... Then you can follow up or block incoming attacks. The timing of these empty cancels are rather strict so be careful. Kuzukaze = (hcb, f+P) close - 'Scum Gale' as it's called in English is a throw in which Iori grabs the opponent, then swings them around which causing them to be stunned for a short period of time. This command throw isn't an instant 1f one, and it also seems that has lost a bit of its range compared to past KOF games. It still is a viable move to use to surprise your opponent at close range, but be careful running in to combo them, they may recover before you hit them. Just whipping out a super or a s.C is a safer option while they are stunned from the throw is much more safer. (EX) = hcb, f+P close - It still isn't instant, but features a fair amount of invincibility throughout its animation, which is good to catch people mashing or throwing out specials while on the defense. You can potentially use this as an anti-okizeme move when you are knockdown, but don't be too predicable with it. The amount of time when the opponent is dazed is still the same as the normal version, so punish them quickly. Koto Tsuki = (hcb+K) - Iori dashes at the opponent then grabs them, knocks them down, and blasts when purple flames. This running throw type of move (which can be blocked) received a bit of a nerf too. The start-up is very slow, while it is still very unsafe on block. It also doesn't give any kind of guard damage to the opponent, which was one of the cool advantages it had in previous KOF games. It only combos from very close heavy hitstun normal moves like close C, crouching C, and his f+A. When connected, it gives the opponent a hard knockdown, and Iori gains a fair amount of time to employ some nasty okizeme options on them. He can safejump, ambiguous roll, roll over them to the other side and hyperhop over them with a taco (j.4b) cross up, etc. If you can confirm into this well into any of his normals that can connect into this move, feel free to use it, or drive cancel it from his second qcb+P rekka. (EX) = hcb+B+D - Iori quickly slams the opponent to the ground, then blows them up with a purple flame. This command throw is not instant, nor invincible, and can be blocked. It is best used as a OTG follow-up in the corner after a hard knockdown from his A version rekkas, and must be performed directly after they are knockdown or else it will whiff. It doesn't seem to connect after doing C version rekkas, so stick to the A versions for this move. But there isn't any other uses for this move beyond using it OTG after a hard knockdown. Ya Otome (aka Maiden Masher) = (qcf~hcb+P) - Iori rushes forward at a fast speed then summons a flurry of punches and scratches, then finishes them off with a small explosive blast. Iori's ranbu super in this game has kept some of the same properties but he cannot pass under a majority of the casts projectiles (except for Ash's b~f+C and Leona's qcb+K). It is best used as a finisher in his bnb combos (ex. cl.C, f+A etc) and to punish opponents specials who have bad whiff and block recovery. But if you block and whiff this super, you can be punished as well, so try to use this super only in combos if you are not sure of certain characters recovery times. Saika = (qcfx4+A+C) - This is his 1 meter follow-up to his super. It adds an extra damage value of 90 and Iori recovers quickly after the opponent falls from the blast. You can crank this follow-up out inputting the command during the last hit of his super where he crosses his arms before the blast comes out. (EX) = qcf~hcb+A+C - A more faster starting, and violent version of his Maiden Masher. The vertical hit box is still the same, which means it still cannot pass under high fireballs, and it doesn't have any invincibility either. Because of its faster start-up, it would make sense to use this raw to punish moves which have bad recovery if you are at a mid to far range on the screen, or certain moves that are hard to punish at close range. Yamisogi = (qcfx2+P) - Iori slashes the air twice then blasts the opponent in the same fire blast that his qcfx4+AC ends with it. This move does a bit more damage than his maiden masher, but has a very close range, so it can be hard to punish certain moves on block that push you back. If your opponent blocks this attack, they may have trouble punishing you if they aren't extremely close to you and they can actually interrupt in between the first and second hit. It's pretty easy to confirm this move from a bnb combo, especially after his overhead attack (f+B). Homurahotgoi = qcb~hcf+A+C - Flames cover Iori's hands, the background turns blood red, and leaps towards his opponent mushing their head into the floor while a bright fire pillar engulfs them both. Similar to his 02/UM HSDM, visually, some of its properties have changed. Firstly, the animation where he leaps towards the opponent isn't very subtle anymore and your opponent can easily jump or roll away on reaction. Secondly, his leap isn't very far, while in 02/UM it cover a great distance. If you're reactions are even quicker, you can dp him before he lands before you. This neomax is an un-blockable grab which means that you should simply jump (any direction) or roll out of the way before it hits. It is better to jump because it is much faster than rolling. This move does end in a hard knockdown but Iori recovers a bit slow afterwards. It is best to use this during a HD combo max cancelled from his qcb~hcf+P (or EX) super which will dish out a LOT of damage. The best time to release this Neomax as a max cancel (during the Maiden Masher) is just when he releases the opponent from his crossed arm choke hold. But if you do it too late or too early, it might miss. Jumping attacks to start combos are optional (but will cause less damage if omitted), and can be either j.A, j.C or j.D. When activating into HD mode, hold back and D (heavy kick) to activate the far D.
(L) = Link, can be a frame trap as well. "(n) frame gap" = The amount of frames that opponent has to counter a frame trap. 1.) far A > far B - 2 frame gap between far A and far B. 2.) far A > cr. D - 4 frame gap between far A and cr. D. 3.) cl. A > cl. C (L) - 2 frame gap between cl. A and cl. C. 4.) cr. A > cl. C - 3 frame gap between cr. A and cl. C. 5.) cl. B > cl. A - 2 frame gap between cl. B and cl. A. 6.) cl. B > cr. A - 3 frame gap between cl. B and cr. A. 7.) cl. B > cr. B - 2 frame gap between cl. B and cr. B. 8.) cl. B > cl. C (L) - 1 frame gap between cl. B and cl. C. 9.) cr. B > cl. C - 3 frame gap between cr. B and cl. C.
After a bnb combo ending with qcb+Px3, if you take a very brief pause then meaty jump in with a hyper hopped j.C then immediately crouch blocking, you can safe jump many characters reversals. Some reversals may be stuffed by the hyperhop j.C, while others may just miss. Zone with Yami barai (qcf+P), and hit superjumping opponents with OniYaki (dp+P). Meet jumping or superjumping opponents air-to-air with j.B which has good horizontal range. Use stand D (heavy kick) against hopping opponents, and crouching C against opponents trying to jump in. These must be used preemptively or else they can be beaten out by the opponent's jump attack. Zone with jump B and poke with stand B to stop opponents from running towards you. Use crouching B to anti-air opponents performing sloppy jump-ins with normals that whiff on crouching opponents. You can also use crouching B to evade and hit opponents that try to jump over you. 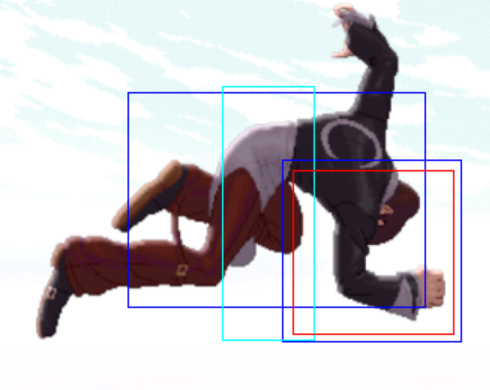 Exercise caution with this because certain jump normals cannot be evade with Iori's crouching B, and can hit him. Hit confirm into a bread and butter combo using crouching B, or stand C. Use j.C to hit crouching opponents. Be extremely aggressive in close range because this is EX Iori's strongest combat range. Stay away from ending into Aoi Hana (qcb+P) during block strings. A second delayed Aoi Hana may provide a small amount of pushback, but some characters may punish him. If the opponent is blocking too much, use Kuzukaze (hcb,f+P) or the EX Kuzukaze (hcb,f+AC) to break their defense. Use Iori's cross-up j.b+B (taco) to confuse and open up players who habitually crouch after a jump-in midscreen, or crouch immediately after a hard knockdown. Be sure to properly hit confirm the cross-up into another hard knockdown combo or an HD combo if you have enough meter. Occasionally end blockstrings into qcf+P to push you away from the opponent. The opponent can Guard Cancel Roll the attack before the qcf+P and punish you if they have enough meter and if you rely on it too much. Andy's db~f+A can be punished on block at any range by Iori's dp+A, dp+AC or qcf~hcb+AC. Around the distance of where Iori's far D reaches, you can punish Ash's A,B,C,D activation with Iori's qcb+Ax3 or his qcf~hcb+AC super. You can punish Athena's f+B on block (and even on hit if they don't follow up with qcb+K) with Iori's qcf~hcb+P or qcf~hcb+AC while Athena is landing. Benimaru's qcf+K on block can be hit at it's maximum distance range with Iori's EX qcb+P or qcf~hcb+AC. At close range, the qcf+K on block can be punished with a raw qcb+P. Against his charge punches (b~f+P) quickly dp+A/C them or super with qcf~hcb+P. Dou Lon's teleport after his 3rd rekka block string can be punished with qcb+AC, or qcf~hcb+AC. EX Iori can punish Elisabeth's dp+AC on block by using his dp+A, qcb+Ax3, dp+AC and qcf~hcb+AC. At a close range, Elisabeth's qcf+A can be whiff punished by EX Iori's qcb+A rekkas. K's qcf+AC~P EX fireball can be evade with a close dp+AC. Be sure that the fireball is near Iori before you perform the EX dp because the invincibility is limited during the start and active frames. Kim's qcb+D can be whiff punished at a far distance by Iori's st.D or cr. D sweep. At a mid or close whiff range, it can be punished with qcb+A or far C. It can punished on block at a close range with a far C or a dash-up close C, or mid to a far range (the last hit of the qcb+D) with any punch strength of Iori's qcb+P rekkas. Kim's qcb+B is hard to whiff punish with many of EX Iori's normals and special moves. His qcf~hcb+AC can punish it before its recovery ends. On block, at a close range, it can be punished with Iori's far C or a quick run-up cl.C or dp+C. At it's max range, it's best to punish it on block with a dp+A. Kim's qcb+BD (EX qcb+K) can be normal thrown during its start-up. On block, Iori doesn't have anything fast enough to reach Kim before his recovery time ends. When a Kim player uses his ff+A to bounce off the wall, dp+C as soon as possible to snuff any of his follow ups, except for his air qcb+BD which has invincibility. 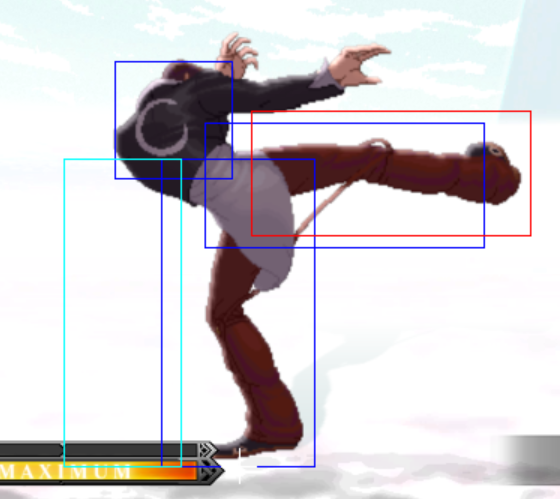 Ex Iori's EX hcb,f+P command throw can eat up Kim's j.A safe jump setup after many of his hard knockdown combo. Kim's qcf,qcf+B is safe on block but has bad recovery on whiff. Use qcb+P or qcf~hcb+P (or EX version) to punish Kim while he's recovering. Preemptive EX qcf+P can hit King while she is falling during her air Venom Strikes (air qcf+K). EX Iori's stand D can evade and hit King's stand B (light kick) right outside of its attack range. King's stand C whiffs on crouching opponents, so use crouching B to duck underneath it and attack her. Punish her qcb+B at close range on block with a dp+C. If someone releases the f+B follow-up, the dp+C will go straight through it. Duck under Robert's j.CD with cr.B or cr.D to hit him on the way down. Punish Robert's db~f+B with Maiden Masher (qcf~hcb+P). You can run up and combo Robert after he lands from a db~f+D. Punish Robert's EX db~f+K with a close C into any damaging combo. Robert's db~f+K can evade Iori's qcf+P projectile. You can evade and punish Terry's j.A, j.B and j.CD with Iori's cr.B or cr.D. 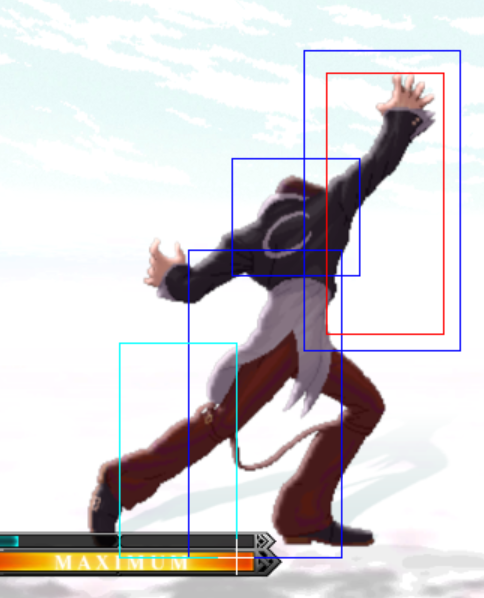 You can evade and hit Terry out of his standing C with Iori's cr.D but careful that it might trade (in your favor, because Terry will be knocked down) and the sweep has bad recovery if it misses. Iori's qcf+AC will clash with Terry's qcf+AC. Terry's qcb+A at it's maximum distance is very safe on block, but very unsafe at close range when blocked. 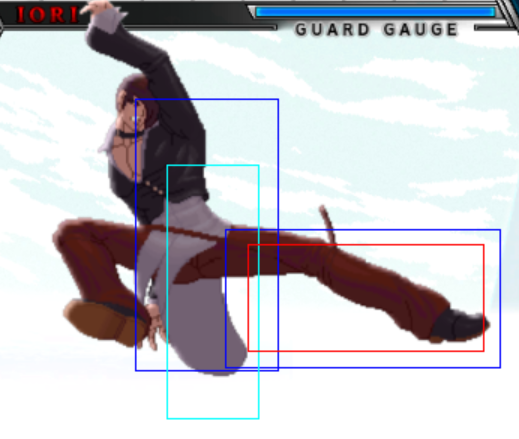 Iori's cr.B can duck under and hit Terry's qcb+D at close range. Be careful of Terry's qcfx2+AC, it can evade Iori's qcf+P projectile. Punish Yuri's EX hcb+K at any distance with EX Iori's qcb+A or qcf~hcb+AC super. This page was last edited on 15 December 2014, at 20:29.